The dominant tradition in the social sciences is to focus attention on those phenomena, social facts, characteristics, or circumstances that differentiate among individuals, groups, or societies; or those that explain negative trends. This approach has its benefits, but like any method that is used exclusively and to the point of exhaustion, it can lead to sterile thinking. In these situations, changing gears or mental schemata is a useful tool that can yield new insights. As a cognitive scientist Steven Pinker knows this very well—and he has applied the technique to a topic that is obviously dear to his heart and of concern to us all: violence and its reverse peace. His book The Better Angels of Our Nature: Why Violence Has Declined provides answers to the question “Why is there peace?” rather than to the conventional one “Why is there war?” Understanding what works or what we might be doing right is as important as understanding why and how things go wrong. Once you spell this out it sounds both simple and obvious—always a signal for a good theory—and the “Aha!” reaction to it must make us wonder why we do not switch our way of thinking more often. Once the question is thus posed, the next step is to question the widespread assumption that violence is on the increase, which often accompanies an equally widespread assumption, namely that the past—all the way down to tribal societies—was a better place, with “man” living in unison with “nature” (and “god(s)”). This finding is all the more surprising considering that we are wired for violence. Our brain provides the hardware for it, and there is more than one software (or reason) for engaging in it. These, our inner demons, the subject of chapter eight of the book, are: instrumental violence, the wish to dominate, get revenge, commit sadistic acts, and actuate harmful ideologies. 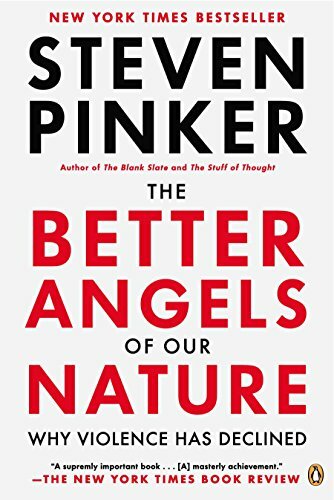 Our “inner angels,” for which we are equally wired—and the subject of chapter nine of the book—are empathy, self-control, moral sense, and reason. “Hormonal plumbing” and biological evolution may have helped in this regard, but the changes are primarily environmental in nature. This is nowhere better shown than with respect to changes in intelligence. The decline of violence, argues Mr. Pinker, has less to do with the increase in the number of intellectuals and more with the fact that we are all getting smarter. Among other indicators, this is shown by analyses of IQ tests carried out by James R. Flynn that demonstrate a general improvement of the ability to reason abstractly and systematically—even among those who do poorly in tests of general or specific knowledge. What’s more, the “Flynn effect” is entirely environmental. What explains the more frequent call upon our inner angels and the less frequent reliance on our inner demons? It is a combination of factors, answers Mr. Pinker, and finding to the right blend has been a long and winding road, but also an accomplishment to be savored. It takes a Leviathan for this to be accomplished: a state with the monopoly of violence but democratic governance and institutions; international collaborative organizations and mechanisms; gentle commerce; the feminization of society; and an expanding circle of sympathy through empathy and reason as powered by literacy, cosmopolitanism, and education. Chapters three to seven of The Better Angels of Our Nature present the evidence for this theory and its history and, by so doing, supply the empirical testing for Immanuel Kant’s theory of Perpetual Peace published in 1795. In these chapters Steven Pinker undertakes a journey across time and social science disciplines, and he must be credited both for his empirical grasp on different theories and for his theoretical imagination to pull it all together in a manner that provides an accurate analysis of developments at the aggregate level as well as explanations for phenomena (and outliers) at the more detailed meso- and micro-levels of social reality. Only few theories (and theorists) can claim such an achievement. For instance, the reader is not only guided through Norbert Elias’s theory of the Civilizing Process and how this has impacted on the decline of violence; s/he is also shown how societal and psychological factors linked to the Civilizing Process, such as the diffusion of a “culture of honor,” continues to impact today on regional and group variations in the incidence of crime. And while the decline of violence linked to war has clearly something to do with democracy, detailed analysis reveals that civil wars are more likely in weak and poor democracies than in either advanced democracies or autocracies, which is why international peace-keeping is important during the transition phase to stronger democratic institutions. Another insight from war statistics is that they distribute themselves as power laws. This means that the more deathly they become, the less frequent they get, but also that extreme values while quite unlikely are not astronomically unlikely. What this “scale-free” nature of the distribution of violence further suggests is that the size of the conflict does not explain the behavior of warring factions. What rather explains the escalation of conflict is the war of attrition, whereby the opposing sides persist in competition (and warfare) despite the accumulation of costs. This has to do with loss-aversion: We go on fighting losing fights because we have already invested (and lost) so much that giving up would make us feel worthless—or as Pinker puts it, “people are suckers for sunk costs.” As loss-aversion and attrition games, wars tend to lead to more losses the longer they go on and to last longer the greater the losses they incur. Take our inner demons and our gooeyness for loss-aversion, add to it an ideology like nationalism (which manifest like an epidemic), and give it military high-tech and you have a dangerous cocktail. But you can activate empathy instead, exercise reason to fight ideology, and use the media of communication instead of military technology—and you just about could be traveling on a peace orbit. And believe it or not, we’ve been doing more of the latter and less of the former. Is that a reason to be optimistic? Definitely, answers Steven Pinker. But this does not mean that we can sit back and do nothing. Once a fight starts, it gains momentum, not to mention that we have still a long way to go till democracy, gentle commerce, international collaboration, feminization, literacy, education, and cosmopolitanism have been entrenched around the world, increasing life quality for the many rather than the few. This is a must-read book and one to return to again and again for new discoveries.